The Mangrove Action Project (MAP) participated in a two days regional training workshop “Carbon Stock Assessment and Emissions Inventory in Asian Mangroves: Executive Summary for Policy Makers” held in Bangkok on April 24-25 2013. The workshop was co-organized by USAID/RDMA (Regional Development Mission for Asia) through their Low Emissions Asian Development (LEAD) program, the US Forest Service (USFS), and the Center for International Forestry Research CIFOR. There were 40 participants from Cambodia, Indonesia, Malaysia, Papua New Guinea, the Philippines, Vietnam, and Thailand. The workshop was part of a two phase carbon assessment training course. The two day training workshop in Bangkok was focused on policy-makers. The second phase is a nine day field training in Trang province, where MAP’s Asia office is based. This field training is geared to researchers and government technical staff from the same seven Asian countries. The training course in Bangkok aimed to help leaders and decision makers to understand the mangrove protocol and how it fits into overall national measurement and monitoring of forest and other carbon stocks and their management for emissions reductions and removals. Course instructors included Dr. Richard MacKenzie, United States Forest Service/ Institute of Pacific Islands Forestry (USFS/IPIF), Dr. Daniel Murdiyarso (CIFOR), Patra Foulk, United States Forest Service/ International Programs (USFS/IP), Dr. Joko Purbopuspito (CIFOR), Dr. Amornwan “Mai” Resanond (LEAD), Todd Johnson (LEAD), Dr Beth Lebow (USFS), and Jeremy Broadhead (LEAF). 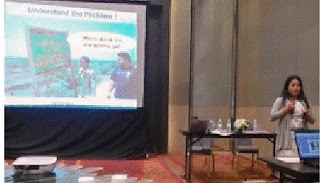 Ning, MAP-Asia’s Field Project Manager, presented experiences implementing Ecological Mangrove Restoration (EMR) in Thailand at the session on “Mangroves and Adaptation to Climate Change”. Ning was also on the panel with the training instructors at the plenary panel discussion. One of the main points she emphasized was the importance of gaining access to the degraded mangrove area in order for restoration to take place. The complexity of land ownership in coastal areas of Thailand and time spent securing sites from MAP-Asia experience has greatly slowed the restoration process. The workshop was a great opportunity for MAP-Asia to share experiences in the region and to re-connect with mangrove network friends representing both NGOs and Government.